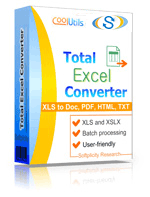 Excel format is the native format of Microsoft Excel. The files of this format usually have xls extension. Excel format is quite widely used due to the popularity of Microsoft Excel which is now one of the most popular microcomputer applications to date. Actually Microsoft Excel was first introduced in 1982 and ran on CP/M systems. Then it was called Multiplan. The first version of Excel was released for the Mac in 1985 and the first Windows version (numbered 2.0 to line-up with the Mac and bundled with a run-time Windows environment) was released in November 1987. Intuitive interface and capable calculation and graphing tools which have made Excel the dominant spreadsheet application available for Windows and Mac platforms. The essence of the program lies in a great idea: the cells are organized in rows and columns, and contain data or formulas with relative or absolute references to other cells.